This is a promo card for the Dacaydance Party at LAX Nightclub, inside the Luxor Hotel Casino, Las Vegas, Nevada. 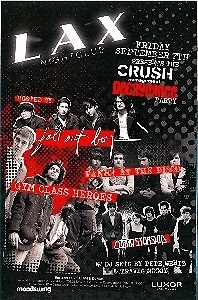 This event took place on Friday September 7th, 2007, featuring: Fall of Boy, Panici at the Disco, Gym Class Heroes, Cobra Starship. Card is 5 1/2 X 8 1/2 in., in mint condition. Buyer is responsible for 1.00 postage within the USA and Canada. Please email if you need additional details on this card. Thanks for checking us out!